Home / Securing a graduate placement – everything you need to know! 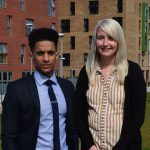 Rosie Allen, 2013 BA Leisure and Tourism Management graduate and Mazen Bashraheel, 2014 BSc International Business Management graduate both secured places on the Campus Living Villages (CLV) Graduate Trainee Scheme and have since gone on to further employment. Here they draw on their experience to offer hints and tips on securing a graduate vacancy. Take advantage of all resources available to you, such as CV writing classes, careers advice, and job fairs as well as talking to other graduates and learning from their experiences too. Visit your employability support team at The University of Salford and they can help get you started and point you in the right direction. They will help you apply for work experience and placement years, give you advice on the best employers as well as what kind of graduate schemes are out there. So go and take advantage of them! All of these resources will equip you with the skills you need to take those all-important first steps in your career. The first step can be the hardest (and scariest) to take, so make sure you use the support that’s available to you and speak to others to see what route they’re taking. Since leaving University an increasing number of employers are looking for more than a degree on your CV. Employers want to see people who have demonstrated the drive and ambition it takes to gain that wider experience. This can be anything from holding down a part time job whilst studying to volunteering in your spare time, completing a placement year at university or being involved in a substantial academic project. Even if you decide to take a break and do some travelling when you finish university (everyone deserves at least a small break! ), look for something extra that will make you even more employable when you return. Give something back to the community you’re visiting and spend a few days volunteering, get a small job to fund some of your travel expenses – just remember to soak up every opportunity you get. It doesn’t matter whether your experience is coming from the working world, an academic background or something different, you have chosen to give yourself the opportunity to learn new things and build on existing skills. It shows that you aren’t afraid to take on new challenges, and are keen to keep on further developing yourself. This is the kind of experience employers want to see. It sounds like such a cliché, and it is, but … one of the best pieces of advice anyone can give you is to be yourself. With the competition being pretty high for graduates seeking work, you need to stand out from the crowd and show them you’re a real person, and not reading from a script like the 10 people before you. Employers want to see the real you and see how well you would fit into the company and align with their values. Give yourself the best opportunity to find the right job that works for you and the employer. Another way of letting any potential employers know who you are is networking. It’s really important to get yourself out there and mix at careers events hosted by your university as well as any industry specific events you can get along to. It’s the easiest way to show employers what you’re all about, and win people over! Also ensure your LinkedIn profile is kept up-to-date and keep your eyes peeled for those networking events. Use Twitter to find key people who are working in the industry you’re interested in, or people you admire, and follow them – keep up to date with the latest industry news and watch how they go about progressing within their career. Exposure is fundamental in getting your skillsets noticed. In a world where digital interaction is at its highest, and knowing the right people is invaluable, make sure you build your network and that people know you for who you really are. Don’t panic! It takes time to find the right job and sometimes you might not even know what it is! Preparation is key so do yourself a favour and soak up any opportunity to gain wider experience that you can. Demonstrate your drive and how employable you are. Embrace the cliché and be yourself. Work out what you want to do and give things a go, you’ll be busy working and longing to relive your university days before you know it! Comments Off on Securing a graduate placement – everything you need to know!